Is Walmart.com really that much cheaper than Target.com? The online research team for Clark Howard, the financial guru of radio, recently compared Target and Walmart's online prices. They chose 30 branded items, including laundry detergent, dryer sheets, toilet paper, deodorant, shampoo, toothpaste, rechargeable toothbrushes, household cleaners, energy bars, ground coffee, peanut butter, snacks, toys, and a few more expensive items such as a Shark stick vacuum, Keurig coffee maker, and a Magic Bullet blender. You can look here to see the specific items and the individual prices, but for the 30 items, Walmart's bill came to $588.58 and Target's came to $593.31, a difference of less than $5. With less than a 1 percent price variance, it's a sign that a price war is brewing between Target and Walmart. Last year Target CEO Brian Cornell told investors, "We believe that consumer perception of value at Target has not reflected how low our out-of-the-door prices are." Further proof of that many consumers aren't noticing Target's price reductions lies in Clark.com's price check. Take nearly any price comparison between the two discounters in the past five years and Walmart's prices were usually found to be about 3 to 5 percent less. But most of the price comparisons done by Howard, bloggers and consumer sites don't mention that Target RedCard holders who use their RedCard to pay for the purchase get an additional 5% discount. No comparison should list only Target's prices with the RedCard discount, but the no annual fee credit card deserves a mention since it's an easy way to save more. In the comparison by Clark Howard's online team, Target is nearly 5 percent cheaper if a RedCard is used. 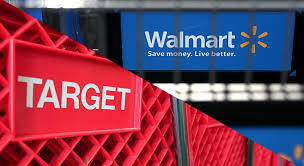 In two price comparisons done by Kantar Retail in 2013 and 2014, Target's prices with the RedCard were found to be about 2 percent cheaper than Walmart. Most shoppers aren't waffling between Target or Walmart. They have a store preference and they're probably sticking to it. But loyalty to a retailer gets murkier online. Consumer experts suggest comparing prices online at places that are actively boasting about their low prices, such as Target, Walmart and Costco.